The following post is one I made a couple of years ago on a previous blog I had. If you are interested in homebrew, I hope you will enjoy all the details I included. If you are only mildly curious about brewing, I plan on doing another batch this year which I will post on later in a much more simplified manner. I went to my local homebrew store which is an awesome store called Stan’s Merry Mart and purchased all the supplies I thought I’d need for $24.21. 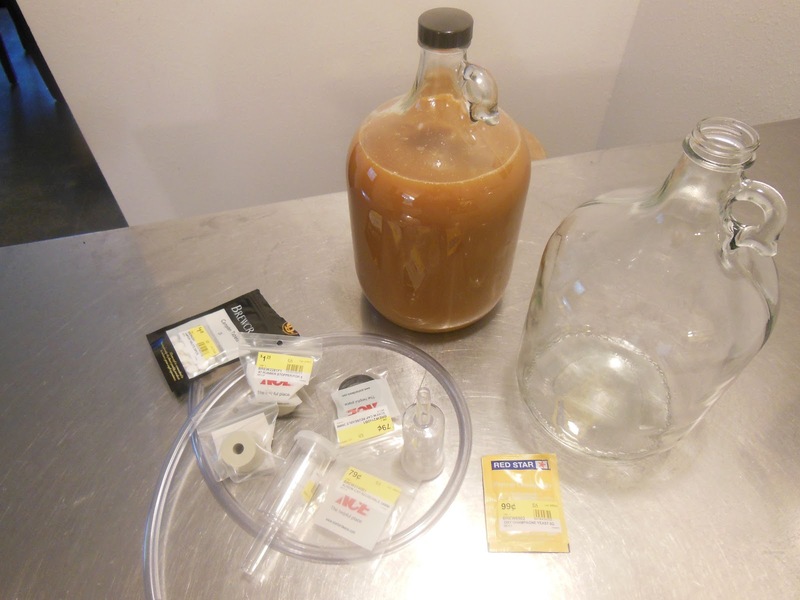 Two glass gallon jugs ($5.47 each), 2 rubber stoppers ($1.29 each), 2 airlocks ($.79 each), 2 caps ($1.29 each), yeast ($0.99), campden tablets ($1.29 for 25) and a 2.3 feet of food grade tubing at $.49/sq ft (I should have bought a longer piece). 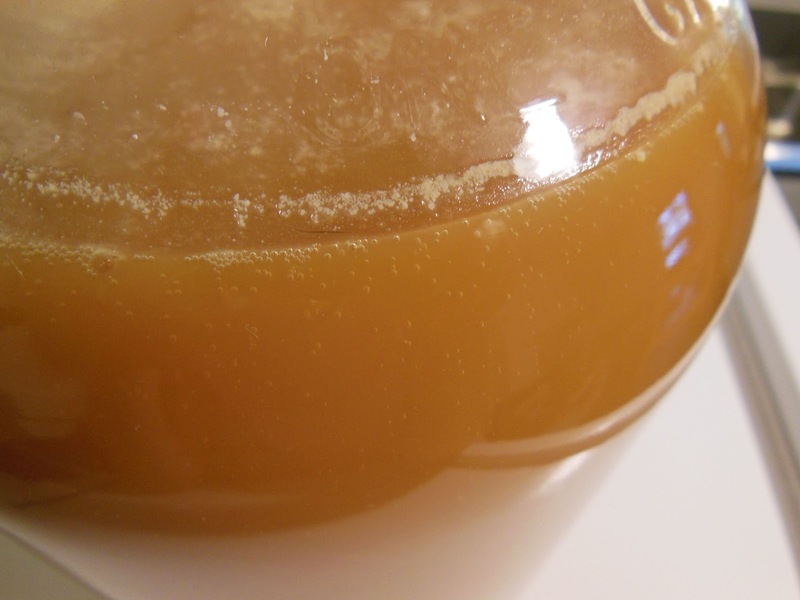 1/2 a packet of Red Star® Pasteur Champagne yeast (I accidentally added a little more than half). 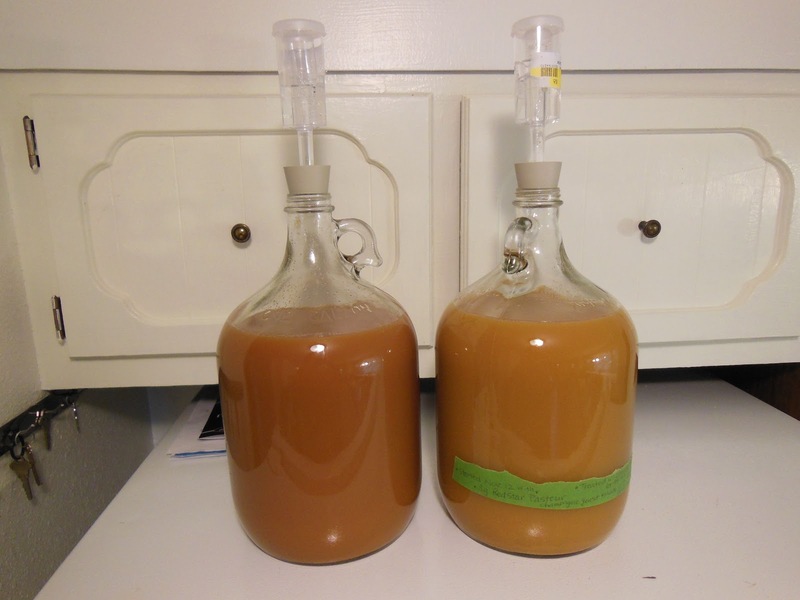 On Nov. 12 I pitched (it means added) the yeast. This was after waiting for 48 hours after adding the campden tablet which kills all the wild yeast, etc. I sanitized the airlock and stopper in vinegar for a few minutes and rinsed it with clean water. I don’t even know if the vinegar does a good enough job of sanitizing but that’s what I did. On the back of the yeast packet it said to add the yeast to warm water but I didn’t want to dilute the cider so I poured out some of the cider and warmed it. 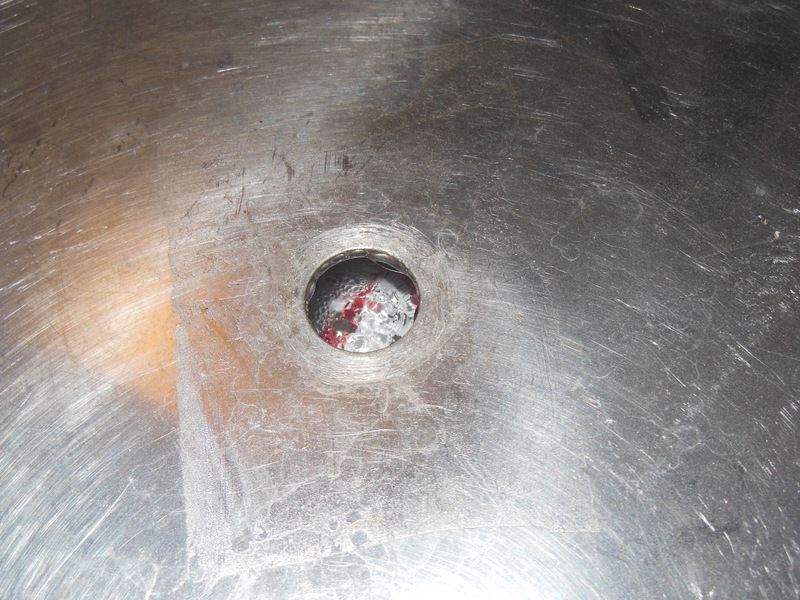 Then I inserted the stopper and filled the airlock with water (some use vodka but I didn’t have any) to the fill line and put that in the stopper. Then the bottle went on top of my fridge. In the morning I noticed bubbles coming out of the airlock. I was so excited. They weren’t very frequent but it meant that the yeast was alive and kicking! photo taken at 8:39 am on Nov. 13, 2012. First, I need to share the single biggest mistake I’ve made so far. I did not take an initial reading of the specific gravity of the juice I started with. Without that I’m pretty sure there is no way to tell what the alcohol content of my cider is. It’s not that the reading is hard to take nor does it require expensive equipment. You can buy a hydrometer at your local brew shop for about $10.00. It was simply a newbie mistake. 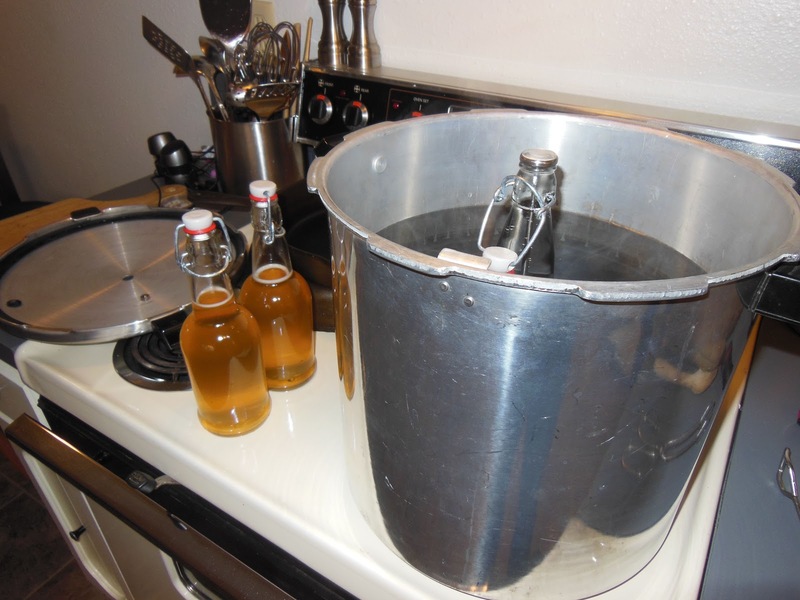 So, to get you caught up on where my cider is at now, I have three batches. The first pressing I did took two days on Nov. 9 and 10. On Nov. 11 I put it into a 1 gallon glass jug and treated it with a campden tablet. 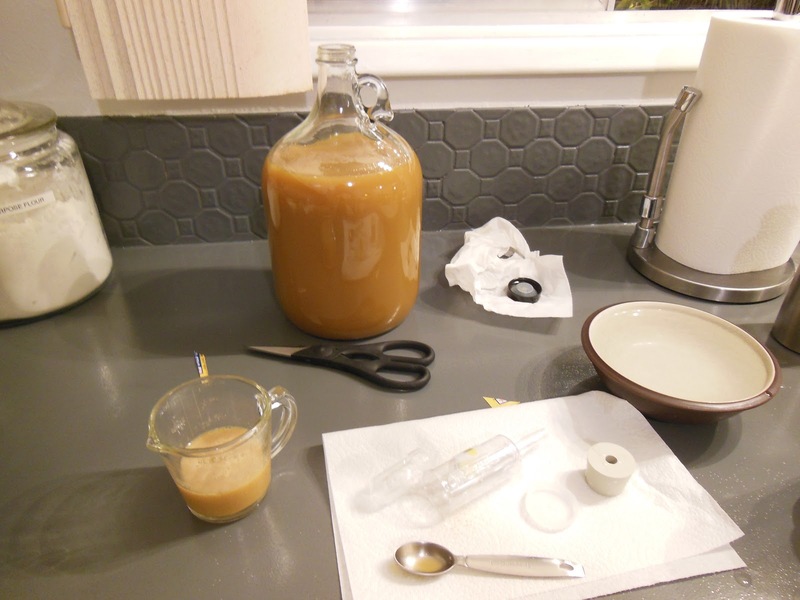 On Nov. 12 I pitched the yeast. 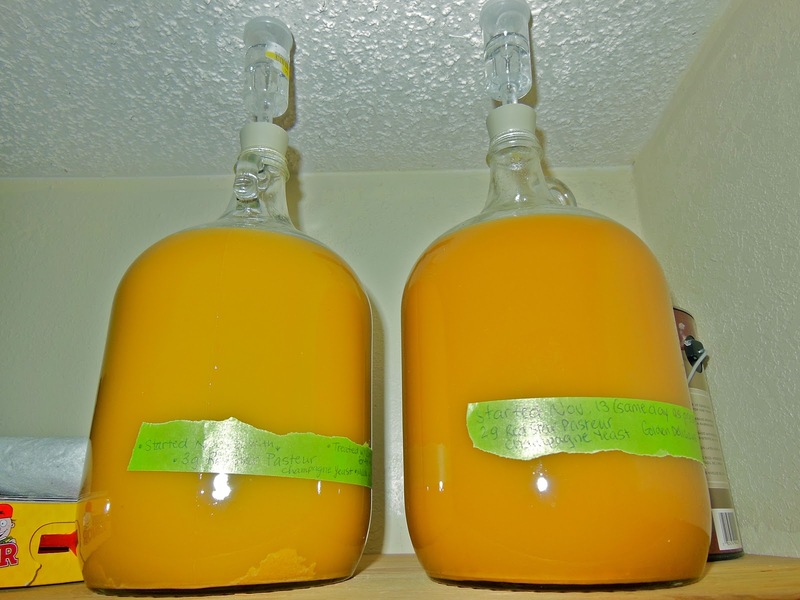 On November 13 I pressed another gallon of juice. For this batch I did not use a campden tablet because I wanted to see what a difference it made. For both gallons I used the champagne yeast I mentioned in a previous post. The third batch was an experimentation with wild yeast. I will post about that separately. I did not add any sugar to anything. I just wanted pure fermented apple juice. The following photo is Day 1 of the Untreated gallon. Here are both the Treated and Untreated batches. On the right is the Treated on Day 3. The other is the Untreated Day 2. The Treated one started fermenting quicker and seemed to finish quite ahead of the other. I had read that the campden tablets were really not necessary as the store-bought yeast was usually strong enough to overcome the wild yeast that is naturally present. I just wanted to see the difference. You may have noticed the color difference between the two. The Treated one was more orangey and the Untreated more brown. Here are both batches again. On the left is the Treated one on Day 4, and on the right is Untreated Day 3. 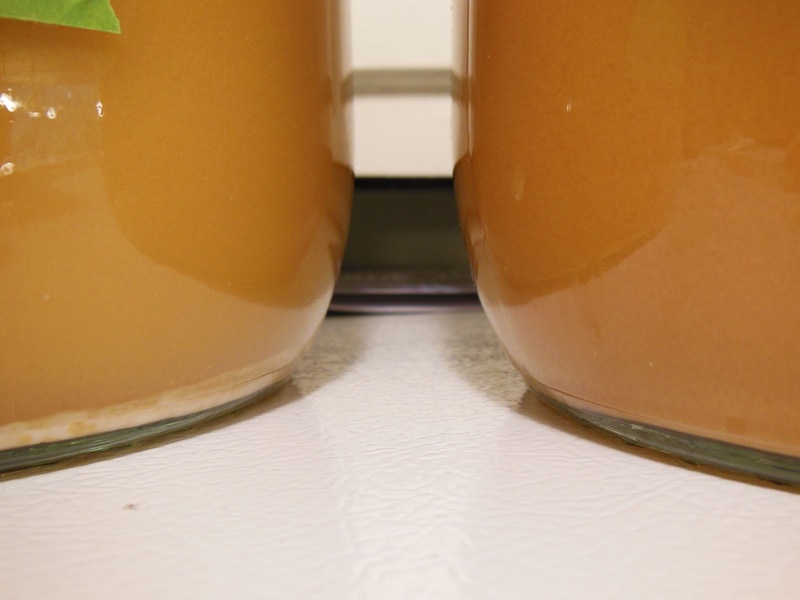 You can see the sediment is greater on the Treated. Here are the two batches on Nov. 21. On the right is the Treated and on the left the Untreated. I tasted them both and couldn’t tell a great deal of difference between the two. They tasted very dry, like wine. I don’t know what percent of alcohol it has but it gave me a nice buzz. It sure would have been nice if I had taken that initial reading! Today is December 1st, 2012 and the yeast seems to be dormant. I know I need to “rack” it off its lees into a second fermentation vessel or bottle it. This means I carefully siphon it out of the initial fermentation vessel trying to introduce as little extra oxygen as possible and leaving behind all the exhausted yeast particles and sediment in the bottom. I believe you can leave it in the initial fermentation vessel for 3 weeks. If you leave it too long it will take on “off” flavors. I just have a couple of days left until that deadline. Here is Treated on the left on Day 20 and Untreated on Day 19. So, I am at the point where I need to figure out how to regain that apple flavor and maybe get it carbonated. I joined the HomeBrewTalk forum so I could ask questions and post pictures to get advice. I haven’t done that yet but it is a very informative and helpful website. I racked it off its lees yesterday afternoon. I have way too much headspace to leave it for long (too much oxygen exposure). I need to bottle it. I think I’m going to add some fresh pressed apple juice. That way the yeast will have something to eat and produce carbonation. I know I need to be careful not to make bottle bombs so I’m going to use a plastic bottle or a swing cap bottle and check it often. 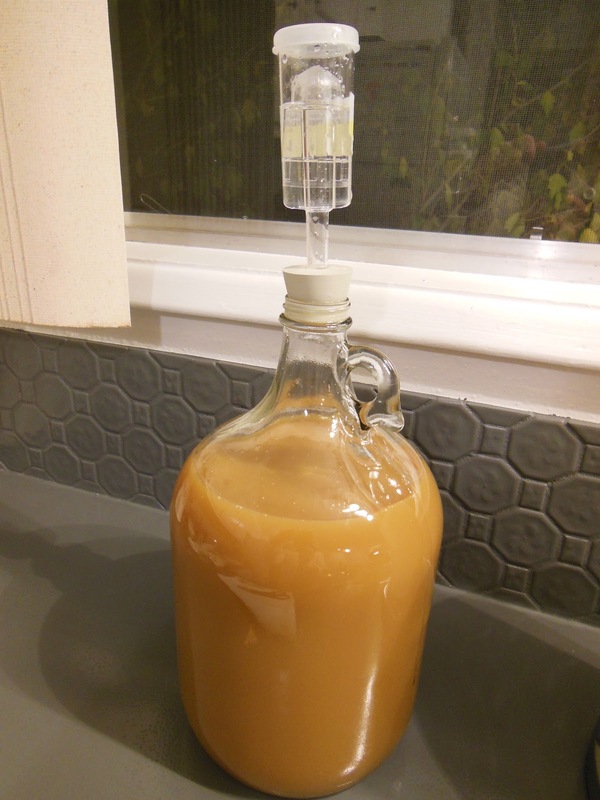 Once it reaches the carbonation I want, I’ll bottle pasteurize it using this method. I found a great website yesterday for measurements and advice for one gallon batches. I’ve found that most recipes and advice is for five gallon batches. I tasted each brew again, too. I can’t tell the difference between the two. Both are very dry and a little harsh. I’ve read that they’ll mellow with age and the apple flavors will come forward somewhat. I plan on keeping a little “pure” (not add any juice to it) to see how I like it in a few months. 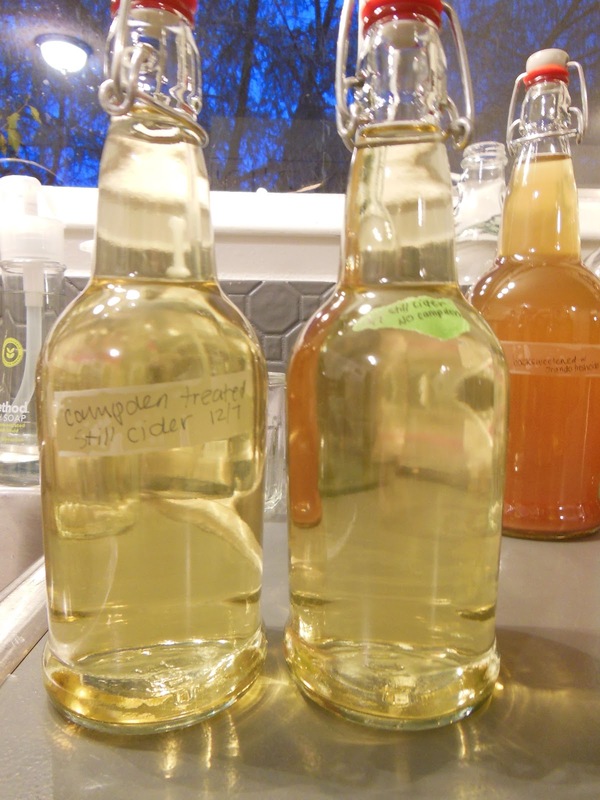 I did try an unfiltered cider that just had some honey added. It’s called Honey Crisp by Crispin. It was very good. Maybe I should do a little with honey, too. 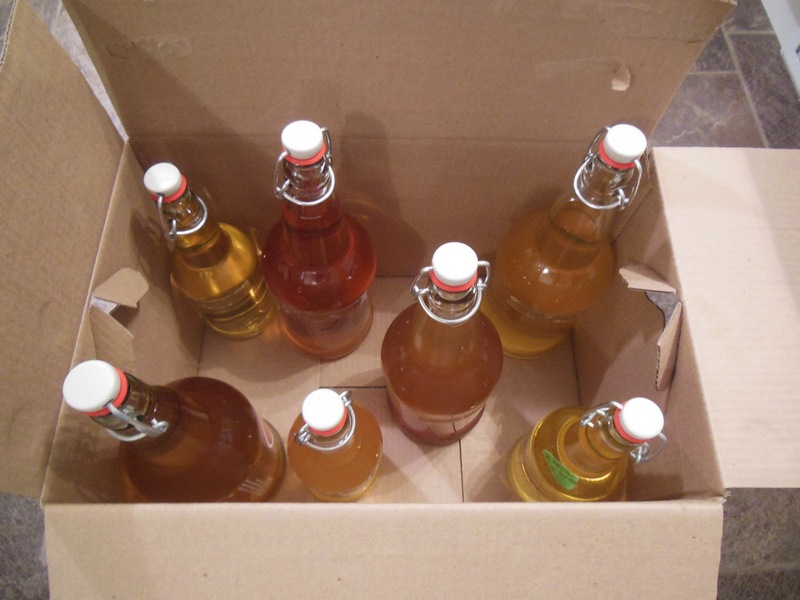 I finally got this cider into bottles. I decided to “backsweeten“. 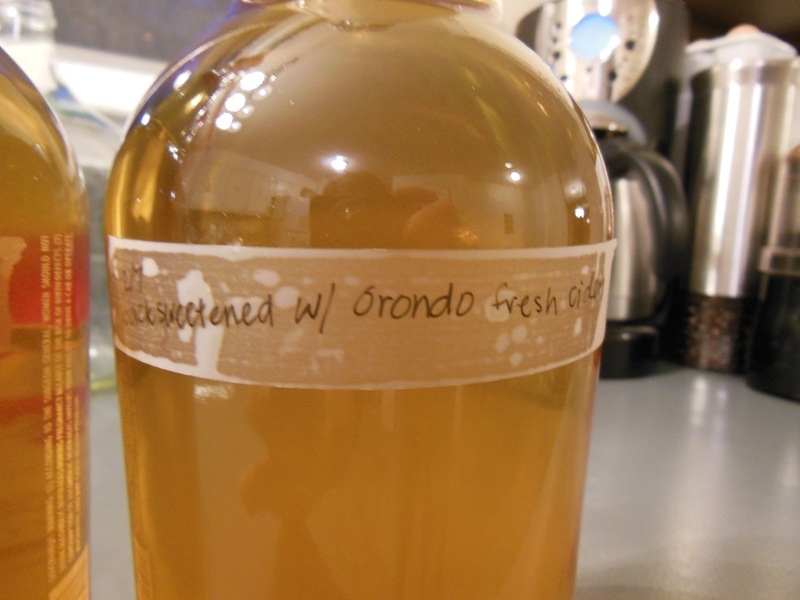 I did keep some pure but in the other bottles I experimented with honey (just to taste) and fresh local pressed cider from Orondo Cider Works ($5 for a half-gallon). It has no preservatives and is just UV treated. 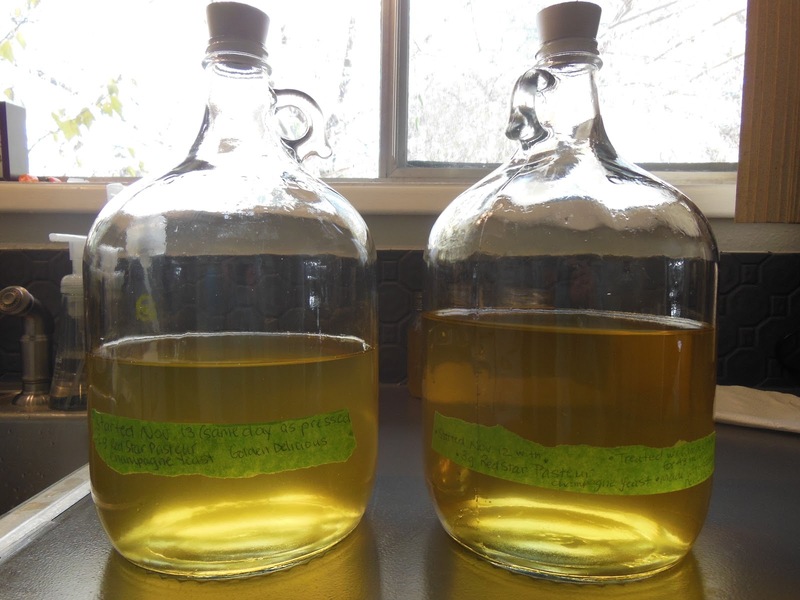 The hardest part about bottling was swirling the cider carefully to mix the honey but not to splash it and introduce oxygen. My plan is to open them every day to check how well they are carbing up. This will happen because the yeast will activate with the addition of sugar and produce carbon dioxide. At the point that I like them I can bottle pasteurize them to stop the yeast. 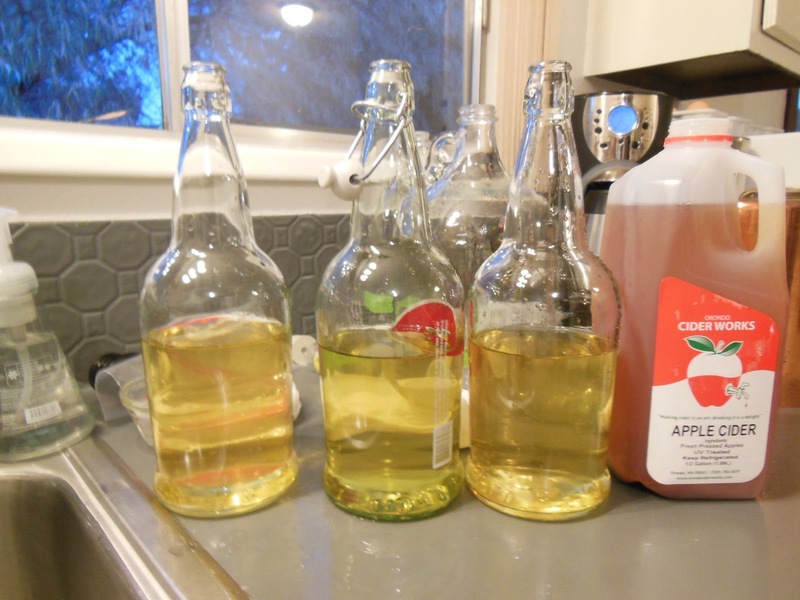 Here’s a photo showing how much hard cider I filled them with before adding the juice. 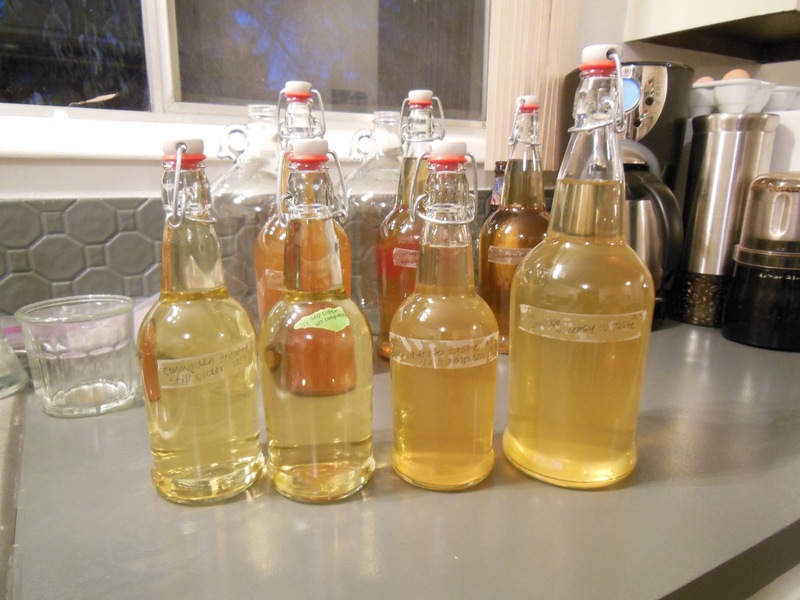 From left to right: campden treated still cider (nothing added), no campden still cider, honey sweetened and honey sweetened (both of the last ones also were from the “no campden” batch). 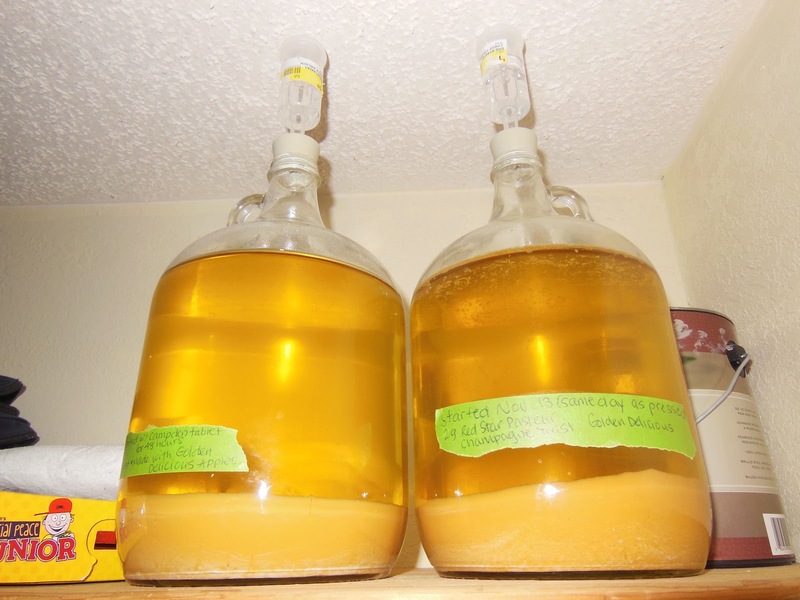 Here’s a close up of the two still ciders. On the left is the one from the batch treated with campden tablets. I just wanted to see if I could taste a difference or not. I am going to check with the people on Home Brew Talk to see what they think about bottle pasteurizing in these bottles. I’m actually really relieved to have this bottled up. I think it was worrying me having so much headspace after I had first racked it. Last night I opened one of my 32 ounce bottles and had to hold the cap on lightly to keep it from overflowing. I put it in the fridge to stop the yeast from multiplying and today I am pasteurizing it. It had some sediment on the bottom so I racked it off into two 16 ounce bottles.I think this was a good thing to do for two reasons. 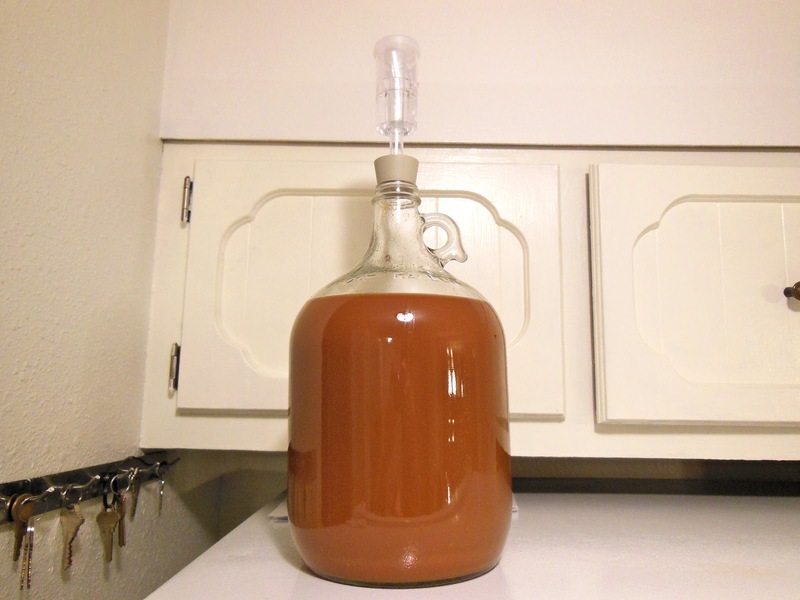 First, racking it off will prevent any flavor change that the cider will take on from sitting on its lees. I did it because the amount of sediment was pretty thick (about a 1/4″ or so). I had used fresh pressed apple juice to back sweeten it and this particular bottle got the last of the jug which had sediment in the bottom. It was the bottle thatcarbed up the fastest, too. So, I think it had quite a bit of natural yeast in that was activated as well. The second reason, was that the bottle from the fridge was cold and I thought it might break if I put it in the 190 degree water. 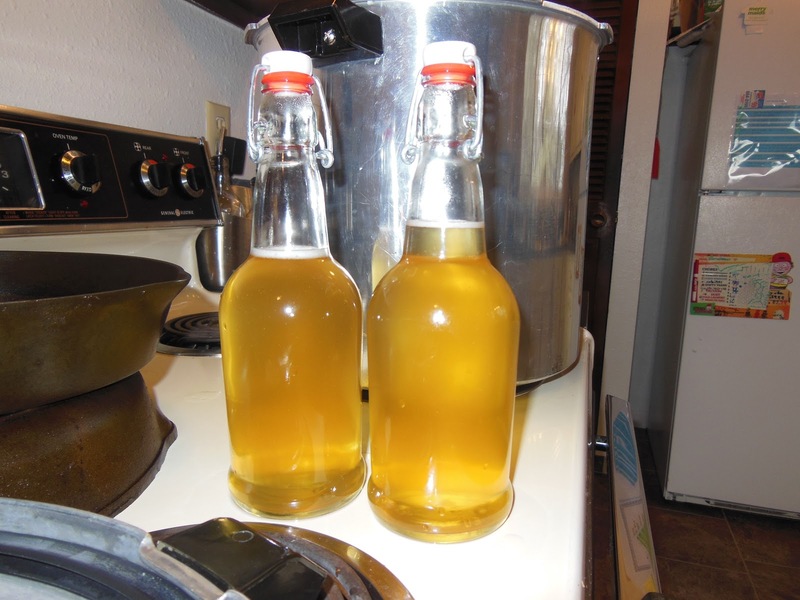 I warmed up the two 16 ounce bottles with hot water before racking the cold cider into them.Below is a photo of the cider in the 32 ounce bottle (in the foreground) before I racked it off. I am also running a test on how long it takes the 32 ounce bottle to reach 140 F. I had read this post on HomeBrewTalk which advises this. I have three bottles in my pressure canner right now. I am only using the pressure canner because it provides a cautionary measure against bottle bombs. I took out the pressure dial so steam can escape. It also gives me a little porthole to view the thermometer in the 32 ounce bottle I have in there. The other two bottles are the 16 ounce ones with the cider. None of my other bottles of cider are carbonated enough yet. 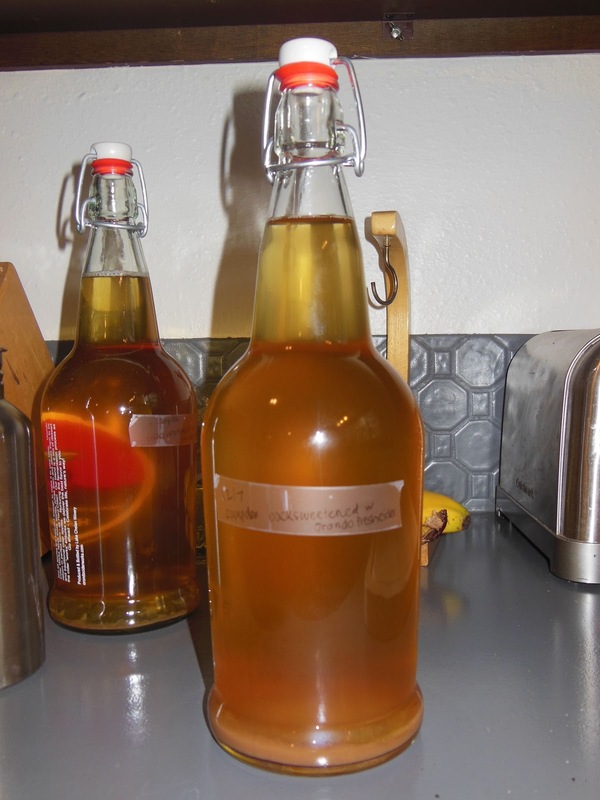 There are two more bottles that I back sweetened with fresh cider and three with honey. So, I just checked the temp and it has been 7 min. It is up to 178 now. Shoot, I missed the 140 mark. Sorry, now I don’t have results to share on how long it took to get there. Now the bottles are out and I checked the temp of the 32 ounce bottle again. It is holding at 178. 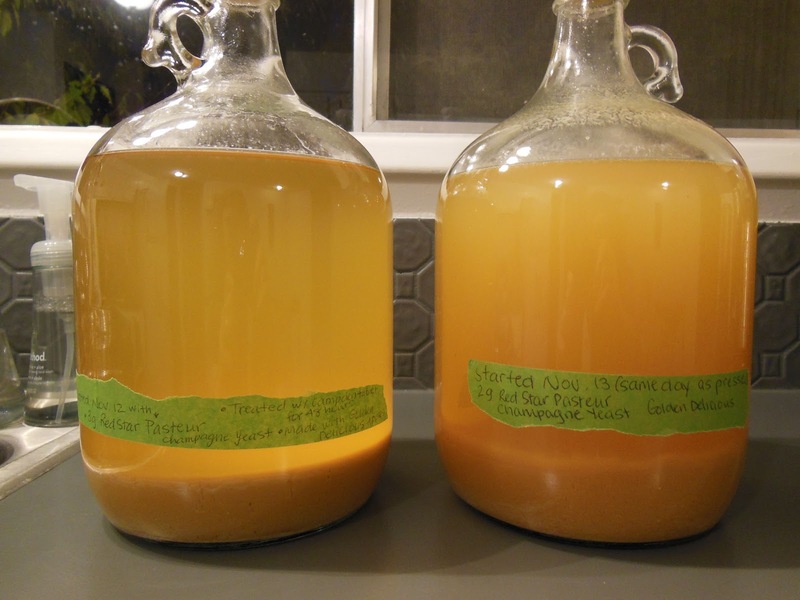 This entry was posted in Fermenting, Food and tagged bottle pasteurizing, grolsch bottles, hard apple cider, homebrew, Papper's method. Bookmark the permalink.